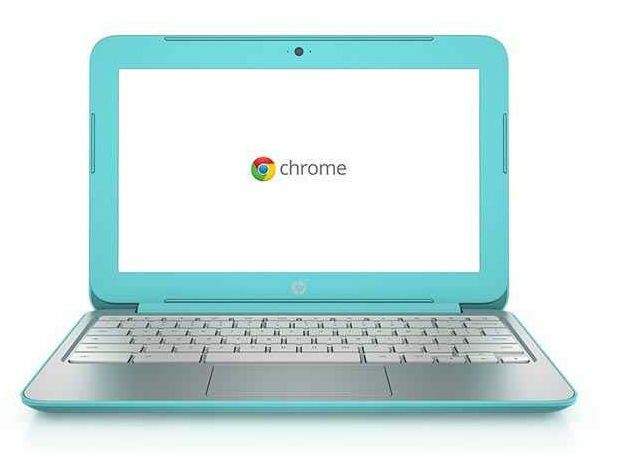 A previous version of this article stated that HP launched two new Chromebooks, including a 14-inch model. There is no 14-inch HP Chromebook with a Samsung processor. 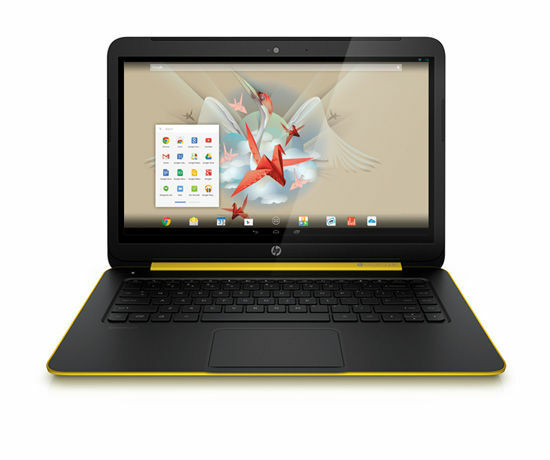 Back in April, a notebook-style computer running Google(s goog) Android software was spotted on the HP(s hpq) site. Although the post was quickly taken down, this weekend HP officially announced the SlateBook, a 14-inch Android laptop with a 1920 x 1080 screen. Its specs aren’t that different from a lot of Chromebooks: 2GB of RAM, up to 64GB of storage, and a Tegra 4 mobile processor. The SlateBook is covered in useful ports, including USB 3.0 and HDMI out options. There are devices with less heft than its 3.75 pounds, but that’s an understandable tradeoff in light of the 14-inch 1080p touchscreen. The HP Slatebook PC runs Android 4.3 — which isn’t the latest version, and is a sign that this machine may not get the speediest Android updates. It’s not a convertible laptop; there is no way to remove the screen from the keyboard and use it as a tablet. But at $430, the SlateBook is a unique option in the low-end laptop market. The use of Android as a laptop operating system is interesting, and it must be a Google-approved experiment as it will have full Google Play support, so it can tap into hundreds of thousands of Android apps. That includes games, which aren’t available on a Chromebook, Google’s preferred operating system for cheap notebooks. Two immediate questions that come with the usual form factor are how well the device handle portrait apps — will it display black bars on both sides? — and how the trackpad will be integrated into the touch-based operating system. According to an HP spokesperson, software is included to “make portrait apps display correctly on the landscape screen.” There will also be a number of apps that won’t support the trackpad, but users can still use the touchscreen. HP also announced a new 11-inch Chromebook starting at $250. The 11-inch model has been redesigned to look more like last year’s 14-inch model, and unfortunately won’t have the same vivid IPS screen as its predecessor. HP’s Chromebook comes with 2GB of RAM, the standard 16GB of storage, and it’s powered by a Samsung Exynos processor. Eventually it will have an option available to add built-in cellular connectivity. The Chromebook will go on sale in July and the SlateBook will be released on July 20. I don’t get the folks saying Android on a laptop is ‘ridiculous’. Why? Lots of people are happy to use an Android tablet for all their computing needs, but wouldn’t mind a real keyboard in a convenient laptop shell, rather than lugging around a separate Bluetooth keyboard. That seems very reasonable to me. laptop with android, sounds ridiculous..
Who the hell needs a laptop with android? Why not just pre-install a standard linux instead? Hmm. I wonder why it doesnt have kitkat installed already? Also, why Android on a laptop at all? I’d imagine people who want a real keyboard (I have a cover with a built-in keyboard for my Samsung Galaxy tablet and use it when I have to do more than a few minutes of typing) and who want the apps. The rest of my computers run Linux. I have two computers not yet running Linux but they will very soon. One of them being a Mac Pro from 2006.